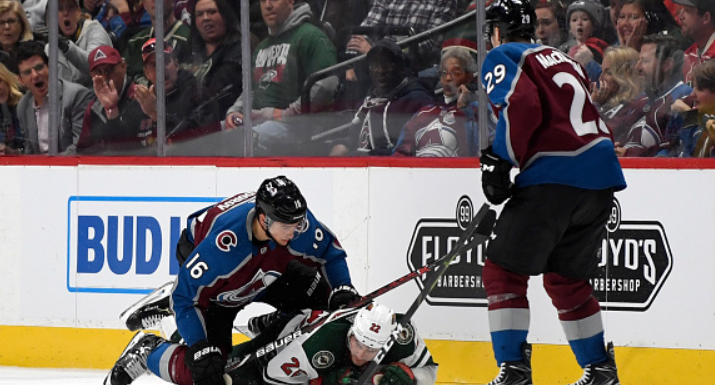 The Colorado Avalanche started their 2018-2019 campaign at home against the Minnesota Wild this year. The team has a whole lot to be excited about between having found a WC spot last season with tons of potential left to build around and still having a chance at the first-overall pick in the Jack Hughes lottery. In order to look ahead to the upcoming season, it’s important that we go backwards first. The Colorado Avalanche were the Cinderella Story behind the Cinderella Story last year. In a season which saw the team go from the worst record in hockey to beating out the Blues for the second wild card spot in the final game of the year, the only thing stopping the Avs from being on everyone’s minds was the success of the Vegas Golden Knights. Now, let me be perfectly clear here in that Vegas deserved all of the attention and publicity that they have received. However, if it wasn’t for them, there’s not a doubt in my mind that Coach Jared Bednar would have won the Jack Adams award for his team’s performance. In a season that included such oddities as trading their All-Star center Matt Duchene to Ottawa in the middle of a game, Colorado managed to nearly double their point total from the previous year – going from a league-worst 48 to 95, good enough to secure a wild card spot. How did they manage to do this? The first thing is an offensive improvement. In the eighth-place 2016-17 campaign, the team was led in goals by Mikko Rantanen with 20 and in points by Nathan MacKinnon at 53. The 2017-18 Avs had four players surpassing Nate’s 16-17 point total (MacKinnon, Rantanen, team captain Gabriel Landeskog and defenseman Tyson Barrie). The brightest spot was the cohesion of Colorado’s top line, post-Duchene trade. MacKinnon found chemistry with Rantanen, leading to the two of them having breakout years and MacKinnon winding up in the top three for the Hart Trophy. Landeskog also had his best season offensive season since 2013-14. The second biggest factor in last year’s success comes from between the posts. After a groin injury cut Semyon Varlomov’s 2016-17 season short, then-backup Calvin Pickard ate up the lion’s share of games of last year, going 15-31-2 with an SV% of .904. When healthy, Semyon Varlomov didn’t do any better, offering a sub-.900 SV% and giving up 3.38 goals per game. This past year showed great improvement out of Varley. His save percentage increased to .920 and he found himself ending the regular season with a 24-16-6 record. With Pickard being selected in the 2017 expansion draft for Vegas and later being traded to the Maple Leafs, newly signed Jonathan Bernier found his share of time in the net as well, posting a 19-13-3. The Avs posted a 10-game winning streak, eight of which games were started by Bernier after Varlomov went down with a lower body injury against the Jets. Between improving drastically on the first line and in the crease, a plethora of young, talented players were able to gain tons of ice time experience with one another. Tyson Jost, J.T. Compher and Alexander Kerfoot all found their rhythm in their first full seasons on the main roster. Samuel Girard, who came over in the Duchene trade, also showed a lot of potential, eventually landing himself on the first defensive pairing with veteran and alternate captain, Eric Johnson. He offers a speediness often reserved for offensive players and is a perfect pairing for EJ, someone who can lock down the defensive end while Girard cuts through neutral ice and can control the puck up and down the blue line. With all of that being said, this boiled down to Thursday night’s season opener against the visiting Minnesota Wild. The Avs were able to fully play the style of hockey we’ve come to expect from them last year. The penalty kill units, which included newcomers Ian Cole and Matt Calvert, held the Wild scoreless on all five opportunities they had with the man advantage. After Carl Soderberg got the scoring started in the first period, Nathan MacKinnon and Mikko Rantanen put together a beautiful tape to tape pass for a tip-in goal midway the second, the first in what will likely be dozens of additions to the first line’s highlight reel. Nikita Zadorov seemed to be Semyon Varlomov’s best friend, constantly clearing the crease and Varley’s vision of the puck. Big Z continued right where he left off, leading the team in hits with four. His physical play was felt particularly by Nino Niederreiter. The two wound up nose to nose a handful of times, but never to the point of a referee stepping in. The only real mistake came early in the first period. Sam Girard misplayed a puck ringing around the boards, turning it over to Zach Parise in his own zone, leading to the only Minnesota goal of the game. In short, the pieces are there. We have every reason to believe this team will continue to make progress towards a deep post-season run in the next few years.